Beneath waving palm branches being lifted high. A chorus of Hallelujahs were joyfully offered aloud. The Chief Priests plotted to ease their fears. The people believed to be God’s son. Oh no! What happens next? For a kiss upon the One, Judas would betray. The disciples were afraid and ran, hiding out of sight. The sent Him to Pilot to finish the case. “Are you King of the Jews?” he wanted to know. Don’t stop! What happens next? But the crowd still chose Barabbas to be set free. They beat Him and beat Him, then laughed as He bled. Jesus knew this was all a part of His Father’s perfect will. I can’t stand it! What happens next? 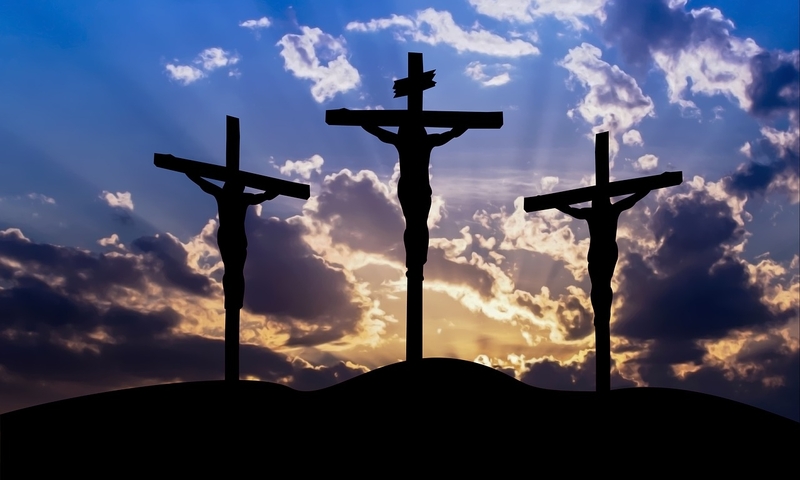 His cross was lifted between two thieves, as the guards gambled below. Then, “It is finished.” Jesus said, as He prepared to die. Mary and Mary fell to their knees as their hearts began to break. Then rolled a stone to close it, as His followers were filled with gloom. Wait! That can’t be the end! What happens next? Returning to find an empty tomb, the women were distraught! Someone had stolen His body, at least that’s what they thought. They ran joyfully to tell the others, the news they had to share! This wasn’t the end of the story, but the beginning of saving grace! 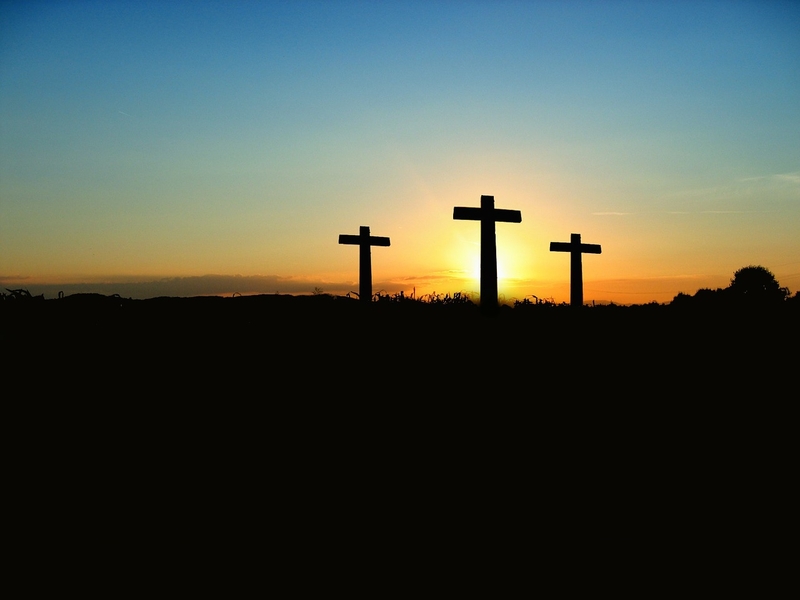 Through His life, His death, and resurrection, Jesus did our sins erase. I’m praying though, you’ll accept God’s gift, and live eternally! I’ve written this poem to join in with the writing community at http://www.fiveminutefriday.com The prompt was “Next”. In addition to writing to the prompt I also am writing poems as part of National Poetry Month. These words came together in such a way that I know God was guiding them. I pray they touch you as they have reminded me of all Jesus went through because of my sins! It’s because of God’s great love for us that we can wait expectantly on this Good Friday knowing that Sunday is Coming!!! Hallelujah! Happy Easter! 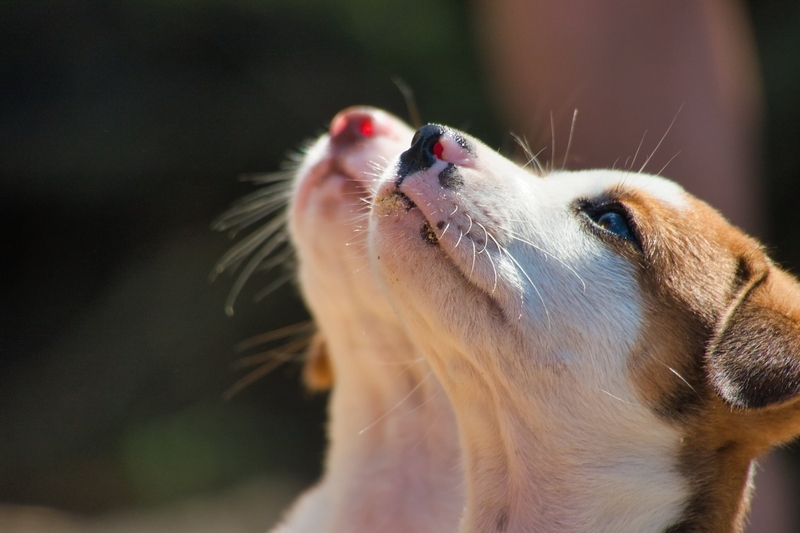 This entry was posted in Blog, Five Minute Friday, Inspiration, NaPoWrMo, Poetic Insights, Uncategorized on April 19, 2019 by Cindy. I don’t lack in clothing. I don’t need more gadgets. But, what about more gratitude? But, do I abound in thanksgiving? For making the most of my days. Time is mine to offer. But, do I offer praise? Neither contentment nor in love. With all my sins to bear. Is one we can never pay back. In praise and gratitude to Him, we should NEVER lack! It took a while, but finally finished this poem for the link up at http://www.fiveminutefriday.com The many creative writers over there have also written to the prompt “Lack” this week. I know you’ll enjoy reading their posts! Inspiration is just a click away! This entry was posted in Blog, Five Minute Friday, Inspiration, NaPoWrMo, Poetic Insights and tagged #fmfparty, #NaPoWriMo, Five Minute Friday, Gratitude, lack, National Poetry Month, praise, rejoice, thanksgiving on April 15, 2019 by Cindy. I could lay down at his feet. I could once and for all defeat. Where I most often live. I’ve no riches nor sweet perfume. To He, who walked from the tomb. Songs of praise He deserves to hear. With a voice so confident and clear. Grace is a gift from God’s own heart. When Jesus hung upon that tree. We who believe are eternally debt free! What we have to offer comes from above. But the greatest offering is love! I’m privileged to be joining the other gifted writers at http://www.fiveminutefriday.com To see what they are “offering” up today just click on over. I know you won’t be sorry! 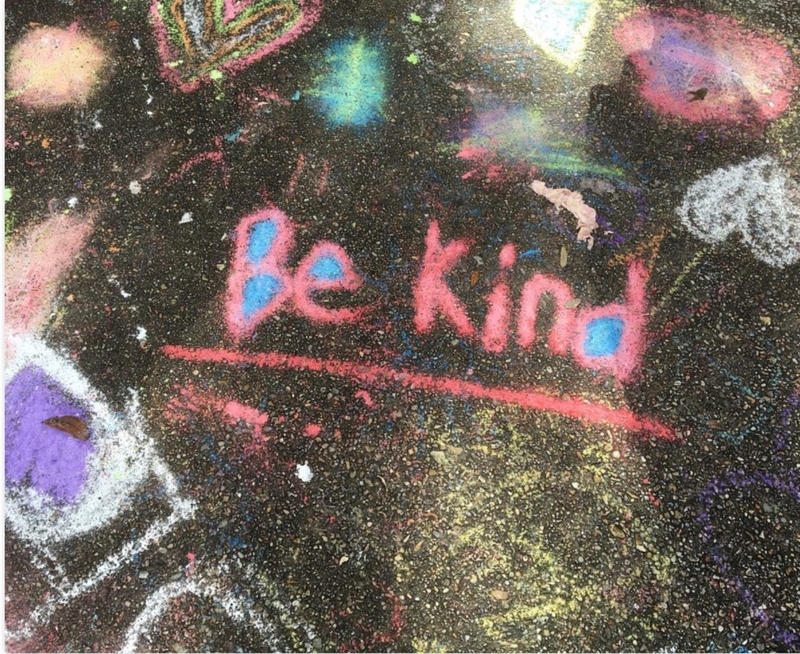 This entry was posted in Blog, Five Minute Friday, Inspiration, Learning in Rhyme, Life Moments, NaPoWrMo, Uncategorized and tagged #fmf, #NaPoWriMo, debt, Five Minute Friday, Grace, Love, offer, Salvation on April 6, 2019 by Cindy. “Compare measurements of an object over time”. This was one of the many new math standards my Second Graders had to master during their school year. At first, I struggled to think of a way to help them achieve this goal, that is until an idea came, as often happens, in an unexpected way: the gift of an Amaryllis bulb! Every year at Christmas time my mom would send one of these fast growing plants to me for my classroom. I finally realized it was the perfect way for my kids to measure change! What about us? How do we measure change over time? Oh, not physical growth, but more importantly, our spiritual growth! Do we compare ourselves with others to determine how we’re doing? Unfortunately, I know I’ve been guilty of doing just that! “Well”, I’d tell myself, “I have a long way to go to catch up with her but just look at me! I’m towering over her!” Anyone else play that game? Looking at others as our standard gives us an unrealistic view of where we are, how far we’ve come, and where we still need to go. The only thing actually being measured when we compare ourselves to those around us is our pride and Paul tells us quite clearly “how ignorant” doing that, really is! Instead we need to be focused on God’s standards and on growing to be more like Christ. 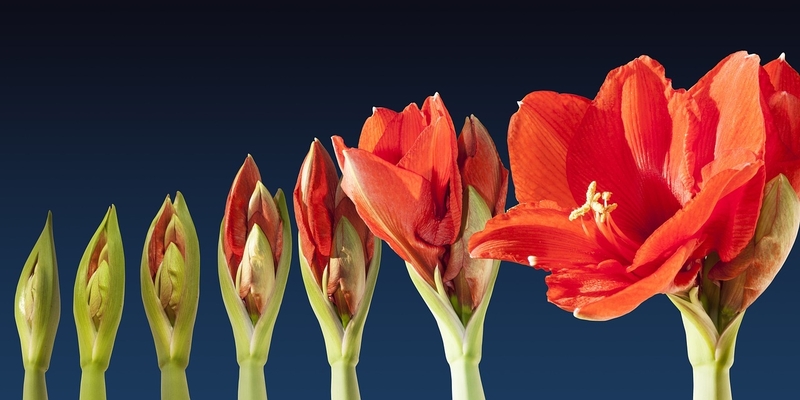 An Amaryllis starts as a dormant bulb but once placed in the soil, given water and light, it grows quickly. Buds form and soon burst open to reveal their inner beauty. It seems to happen almost over night! Maturing spiritually however, is a much slower process. Like a bulb though, on our own our potential lies stagnant. The full measure of who we can truly become started with Jesus on the cross. When we are planted in His gift of salvation, receive the Living Water, and live in the Light of the Son, we begin to change over time. Inch by inch, day by day, challenge by challenge, grace upon grace we grow “in every way” to be more like Christ and soon our inner beauty, which is an overflowing of God’s love, is revealed to the world. My students used their rulers to help them observe and compare the progress of our class plant. As we monitor our spiritual growth, we don’t have to worry about how we compare to others, instead we must examine how our lives align with God’s standards. Thankfully, we can look to the life of Christ to guide us and help grow our faith and with confidence, know that He is the only measuring stick we’ll ever need! This entry was posted in Blog, Five Minute Friday, Inspiration, Life Moments, Uncategorized and tagged #fmf, amaryllis, Five Minute Friday, measure, measurement lesson, Salvation, Second Grade on April 1, 2019 by Cindy. Thirty: This seems to be the first birthday we dread. I think it’s because we feel as if we’re leaving youth behind and facing adulthood square in the face. That was the least of my worries on my thirtieth birthday, though! On the day I turned thirty I was almost two weeks overdue with our second baby, on bed rest, and my thoughts were not on myself but instead totally focused on that new little life. Forty: As difficult as it seems to turn thirty, becoming forty somehow feels worse! We think of our parents being forty, not us! I can honestly say I wasn’t looking forward to it at all! Then, the boxes began arriving…..Every old age gag available filled box after box. Black balloons, Oreos on a “40” plate, a giant ear with hair growing out of it! The list goes on and on. My sister took a day I was dreading and turned it into a time of joy and laughter! Fifty: Ok, let’s face it, the big 5-0 is tough to handle! I had friends who crossed over to the dark side before me, so I was already hearing the horror stories of how your teeth and feet are the first to go. Our house was an empty nest, my internal thermometer was on the blink, and I felt adrift. Celebrating was not on my agenda but love changed my plans! My sneaky family orchestrated a huge surprise party and surprised I was!!! I laughed. I cried. I. Felt. Treasured. Suddenly, turning 50 didn’t seem so bad. Love changed that for me, too. That brings us to yesterday…. Sixty: You should know that I’d been struggling with the thought that I was going to be sixty. SIXTY! I can remember my grandma telling me two things that I now relate to: 1) The older you get, the faster time passes (so true) and 2) That even though her body looked her age, she still felt like a young woman on the inside (ditto!) It just seemed so weird to think that I could possibly be sixty years old but the more I began to think about my life and after a few pep talks and devotions that seemed written just for me, God reminded me that 60 years is a gift worthy of celebration! Life itself is a gift worth celebrating! And I’m living a great one! Yesterday was made so special by the wishes, messages, cards, and gifts that I received and to tell you the truth: sixty feels pretty good! Looking back has a way of putting things into perspective and I have found that each decade has taught me a lesson about what it means to be not just alive, but alive in Christ! My thirtieth birthday came and went without anguish because my thoughts were focused on someone other than myself and isn’t that how we should live everyday? Facing forty seemed overwhelming but once laughter was added, suddenly I was able to find the joy and the dread faded away. Life offers us plenty to dread, but what we do with it makes all the difference, not just for ourselves but also for those around us. Counting our blessings has an amazing way of helping us focus on what’s most important! Love. It changes everything! We are called to love…our neighbor, ourselves, and even our enemies! On my fiftieth birthday love was a light in the darkness! What a great reminder that we are to be that same light of love in the world. And finally, the lesson I’m learning right now as I type this: I am blessed to have been given the gift of these 60 years! 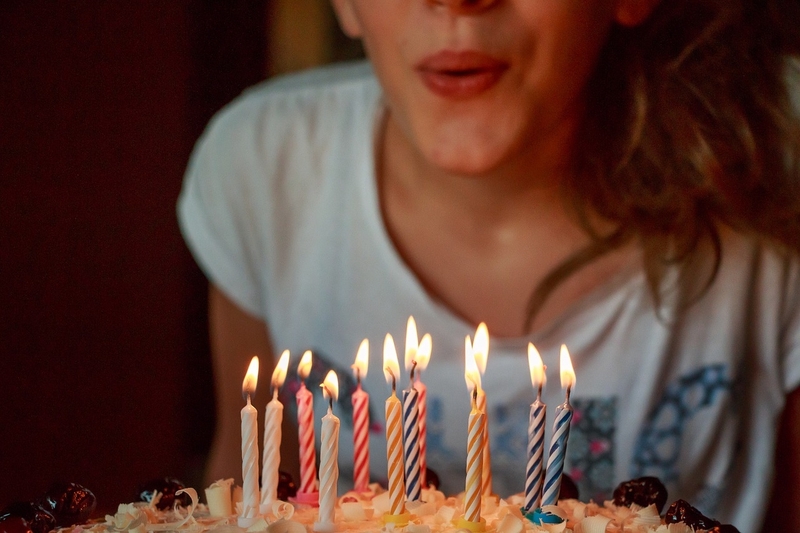 Turning 60 isn’t something to regret, but something worth celebrating, something to embrace! It’s true for whatever year you’ve been gifted with! My birthday reflections have shown me that it isn’t the number of candles on the cake that we should count as important. What we’re going to do with the number the Giver has gifted us with is what really counts. Living out these birthday lessons by putting others first, finding joy in all situations, loving those we come in contact with, and recognizing that each day we’re given is a gift help us celebrate not our birth but our rebirth. The reward that awaits us as we live in Christ is the best present we can ever receive! So with that in mind I say, Hello sixty! I can’t wait to see where you take me! And if it’s God’s will, look out seventy! Here. I. Come! I’m joining the writing community at http://www.fiveminutefriday.com today on the prompt “Reward”. I’m looking forward to reading what others have written If you’d like to join me just click on over. You won’t be sorry! This entry was posted in Blog, Five Minute Friday, Inspiration, Life Moments, Uncategorized and tagged #fmfparty, birthdays, celebrations, Five Minute Friday, Reflection, Reward, turning sixty on March 22, 2019 by Cindy. As usual on Fridays I’m joining Kate Motaung and the other talented writers at http://www.fiveminutefriday.com The prompt today is “More”. My children accuse me (and maybe, just maybe, rightly so) of introducing my grand dogs to the art of fine dining from the kitchen table. Whenever I…I mean SOMEONE…offers them a tidbit, I’ve noticed something: they don’t take it and leave. No, they accept the offering and then continue to sit right there looking up expecting more. Funny thing is, as I think about it, I’ve come to realize that I need to follow their undeterred example, not with food (I’ve already learned that lesson) but rather, with God. I don’t know about you, but “wait” is one of those four-letter words I’d rather avoid! And wait patiently? Not something I’ve mastered at all! This past week though, God reminded me that His timing is always perfect even when it seems too slow to me! This past summer, I felt the Lord urging me toward an undertaking that was outside my comfort zone. I hemmed and hawed. I reminded Him of all the reasons why I wasn’t the right one for the job. I worried and complained. In the end though, it was clear to me this was my assignment to complete and so I did. Excitement filled me as I anticipated the smorgasbord of blessings that would result from this project, but instead, it was only a tidbit I was offered. Did I stand firm, wait patiently, and look up expecting more? Not even close! Though I hungered for more, disappointment set in and I left believing the whole thing had failed; I’d failed. Fast forward eight months to today…. God has brought an unexpected outcome to the table from this very same project and I’ve been feasting on His goodness ever since! Goosebumps have tingled, tears shed, and praise has been lifted! 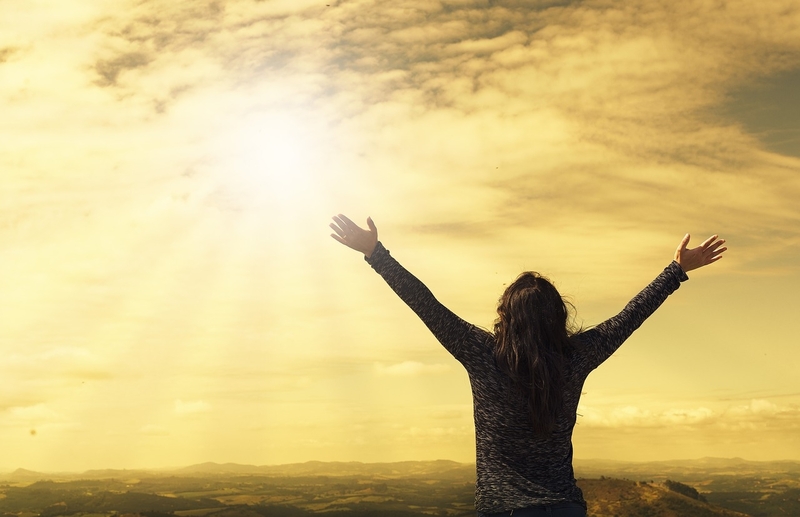 Maybe you know exactly what I’ve experienced because you’ve had a prayer finally answered, a God-given dream come true, or like me, a hope for results realized. As I continue to be amazed by this turn of events, I’m also realizing they were long in coming not for the sake of the project, but that He’s been being patient for my sake! God is using this opportunity to remind me of some important truths: to step out in obedience (without complaining) even when it is uncomfortable, that His timing is much better than ours, and that He can use our little to do something BIG! But most of all, He’s teaching me and all of us, that we should not be people who are unexpectedly surprised by what He does but rather those who are bravely undeterred, who keep looking up, and those who are always expecting more! This entry was posted in Blog, Five Minute Friday, Inspiration, Life Moments and tagged #fmf, expect more, Five Minute Friday, God's timing, more, obedience, undeterred on March 8, 2019 by Cindy. February has been a weather extravaganza! We’ve had rain and more rain. Sleet, snow, ice, sub-zero temperatures, and today it is sunny and 50 degrees! Plans have had to be changed, there’ve been unexpected challenges, and also moments of immense beauty. We can’t control the weather. It plays with our emotions and definitely gives us something to talk about! Isn’t that just like life? I pray your life has gone a little more smoothly than the weather has this past month! I love being part of this link up at http://www.heathergerwing.com where we share “Four Somethings”: Something loved, Something said, Something learned, and Something read each month. Here are mine…. I don’t know about you, but these days my mail usually consists of bills, requests for donations, and advertisements for things I don’t want. This month was a little different though because in the midst of the everyday delivery to my mailbox, I unexpectedly found my something loved. Opening a tiny box revealed a big surprise. 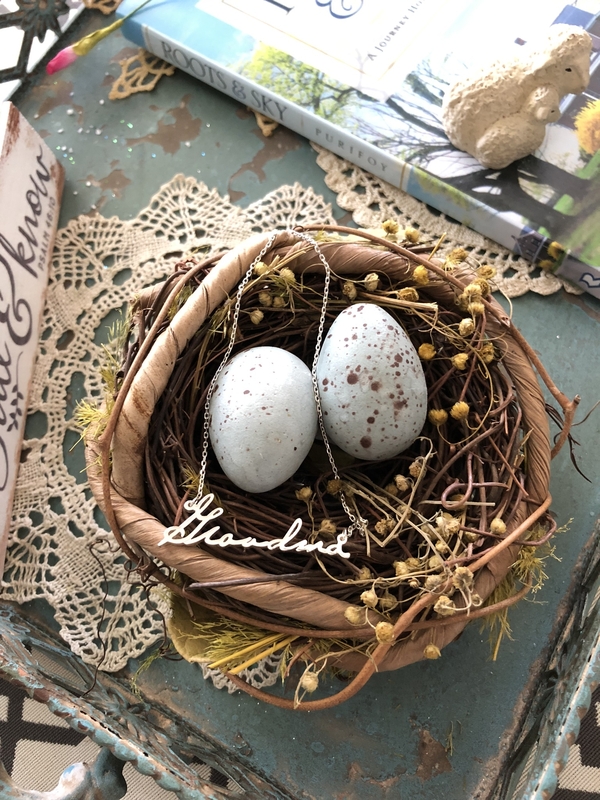 Nestled inside, lay a necklace created from my Grandma’s signature. Memories immediately filled my heart and overflowed down my cheeks. The accompanying card, containing words I’ll treasure forever, was as much a gift as the necklace itself. Going to the post office that day, I never imagined I’d come away with a blessing. A blessing that reminds me that Grandma’s life is inscribed upon mine and that, inspires me to be to my own grandchildren, who she was to me. This something loved also motivates me to look for unexpected ways to show my love and appreciation for others, just as was so generously done by a special someone, for me. Just imagine what our neighborhoods could be like if we would live these words Mr. Rogers said! 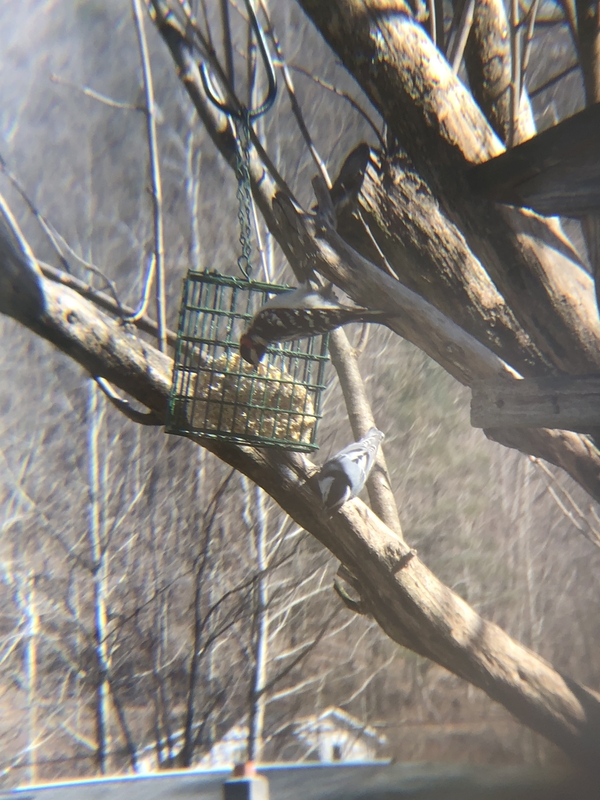 I’ve learned that birdwatching in my front yard is now so much more exciting, all because of my Valentine’s Day gift! My husband surprised me with a telephoto lens for my iPhone! 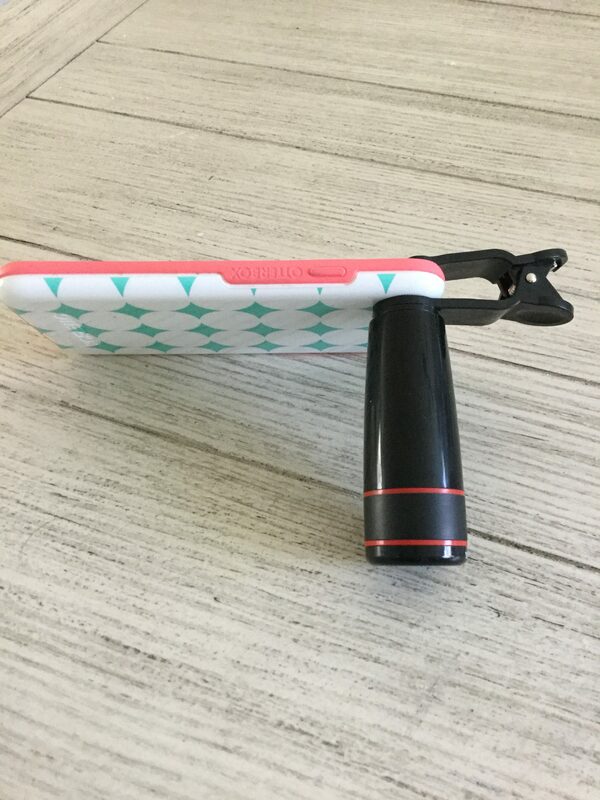 Who knew such a thing even existed? Oh. My. Word. This book! The story of a wayward donkey who is rescued, cared for, and loved by a family who never expected to be his owners. And while you might think that Flash, the donkey is the lucky one, the story is actually about how he transforms and blesses his people! 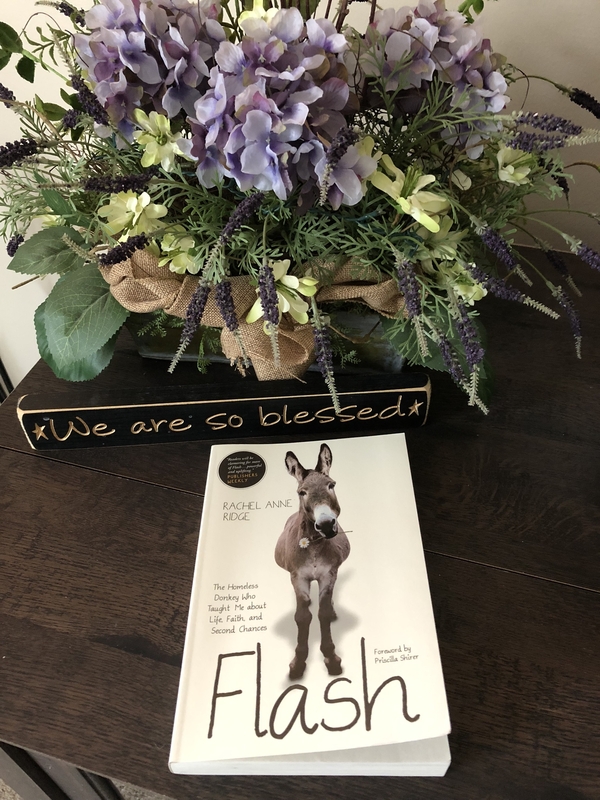 Rachel Anne Ridge writes in such a way that you feel you’re sitting across the table from her drinking coffee together or on the sofa side by side sharing a bowl of popcorn as she tells you her story of how a large eared donkey taught her about “life, faith, and second chances”. It’s one of those books that I wanted to highlight line after line in! I can’t wait to read her soon to be released sequel! Well, there you have it! February with her ups and downs, sunshine and snow, peaks and valleys is all but finished. What surprises did she bring you? Be sure and let me know in the comments. Until next month, Happy Loving, Listening, Learning, and Reading! This entry was posted in #Write28Days, Blog, Inspiration, Life Moments, Share Four Somethings, Uncategorized and tagged #Flashthedonkey, #ShareFourSomethings, #Write28Days, something learned, something loved, something read, something said on February 28, 2019 by Cindy. This is the scripture I used to describe my boss, my mentor, and my friend: Ken Price as I spoke at his funeral, fourteen years ago this week. As a young teacher looking for a job, I’d about given up hope. School had started in most districts and there I was still without a classroom. But then, just when I least expected it, my phone rang and Ken was on the other end offering me a job in West Virginia. I immediately said yes! He drastically changed my life that day. Not only did he give me the start to a career I loved which lasted 32 years; he also had a hand in changing this city girl into a country girl and introducing me to my husband. Ken pushed me to leave my comfort zone, think outside the box, and he continuously challenged me to be a better teacher and person. Somewhere in the process he became a treasured friend, both to me and my family. The crowded gymnasium was alive with energy. Our daughter was in the middle of cheering the basketball team on to victory and we were joining in, shouting at the top of our lungs. Then in the midst of the excitement, just when I least expected it, news came that Ken, our Ken, had suddenly passed away. In that moment, I felt as if the basketball had hit me and knocked the air from my lungs. The cheering continued but I couldn’t hear a thing. Making my way out of the gym, I didn’t want it to be true. It was. I prayed it was a mistake. It wasn’t. And once again, my life changed that day. As I stood on the stage in that same gymnasium a few days later, the crowd was quiet this time. Speaking from my heart, I shared how Ken had allowed me to be me without judgement. That he compelled me to expect more out of myself without condemning and how he shared his wisdom without reservation. The truth is, my life would have been profoundly different had it not been for Ken Price. He possessed many of the Spiritual Gifts listed above and his spirit was a gift to me. Oh, how I wish I would have told him so when I had the chance. The anniversary of his death reminds me how very important it is to always let those who mean so much to us, know! Not just on holidays. Not someday. Not even tomorrow. Let me ask you: is there someone you’re thinking of as you read this? Please don’t wait! Tell them now; because you and I know that just when you least expect it, life changes and the chance is gone. So make the call, send the text, FaceTime, or wrap them in your arms. You won’t be sorry! And who knows? Maybe you’ll change a life, just like Ken did mine! This entry was posted in #Write28Days, Blog, Five Minute Friday, Inspiration, Life Moments and tagged #Write28Days, Five Minute Friday, Just, Love, Share, spiritual gifts, unexpected #fmf on February 22, 2019 by Cindy. Do you remember getting a Tootsie Pop when you were a child? Their commercial challenged us to find out how many licks it took to get to the Tootsie Roll center; so we’d carefully start counting trying to keep the hard outside intact. Before too long though, the inevitable happened and CRUNCH! The covering cracked and we found the chewy center. When it comes to being confident, I’m kind of like a Tootsie Pop. Maybe, you are too! On the outside, I appear solid, sure of myself. As I lead a meeting, present a children’s sermon, speak to a crowd, or visit someone who’s in need, it looks as if I’m that rock-like sphere atop a sturdy stick: assured and fearless. In reality however, I’m nothing but that soft, gooey center: insecure and scared, hiding behind a sugar-coated shell. I’ve often wished to have true confidence, to be certain and bold in my abilities. But lately I’ve begun to look at it in a different way. When I’m in the midst of a situation or task where I don’t feel self-assured but am still able to handle it, I’ve found my focus turning from myself to saying things like: “To God be the glory”, “The Holy Spirit guided my words”, and “This was an answer to my prayer”. God has been showing me once again that it’s not about me! I’m learning that even though we may not be sure of ourselves in all areas of life, God can use that “soft middle” to teach us about His power in our weakness. What a comfort to know, confident or not, Christ is the one who makes us strong! How many licks does it take to get to the center of a Tootsie Pop? I don’t know. Lots, I’m sure. What does it take to uncover and use each of our soft centers? That I do know! Our One and Only God! And He won’t stop until our work is finished. Now that’s something we can really sink our teeth into! Joining up with http://www.fiveminutefriday.com and http://www.anitaojeda.com today to write on the prompt “Confident”. Why don’t you “pop” or “roll” on over and see what others have written about! This entry was posted in #Write28Days, Blog, Five Minute Friday, Inspiration, Life Moments, Uncategorized and tagged #fmf, #Write28Days, Confident, Five Minute Friday, insecure, soft center, strong, Tootsie Pop, weakness on February 15, 2019 by Cindy. I’ve recently returned home after spending a few days with my grandsons. Oh, my heart is happy! We made a tent, read stories, played on the swings, and blew bubbles. 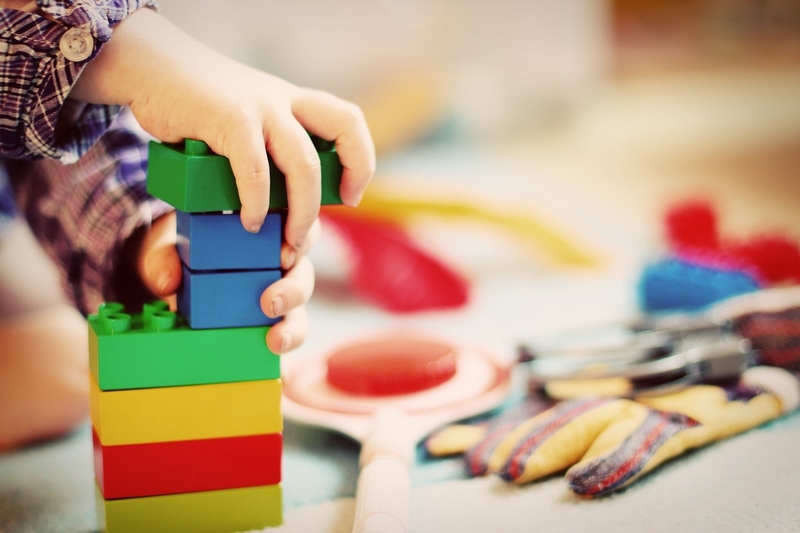 Along with other little boy fun and games we also spent time together using blocks to build towers. Here’s what I’ve noticed over the years, we adults are very protective of our towers! While the wee ones like laying one block upon the other, their favorite part of building is actually the knocking down! And they are good at knocking down! I’m ashamed to say that there have been times that I’ve had to bite my tongue because I was about to whine (or even get a little angry) when they chose my tower to topple! Silly, right? But aren’t we the very same way about building our towers in real life? I don’t know about you, I like to be the architect and contractor in one! In other words, I want control over my tower! We carefully stack our “blocks”: the job we have, where we live, who we marry, the goals we pursue, the people we spend time with and the tower gets higher and higher. We’re in command of it all. That is….until we’re not. The promotion we were counting on doesn’t come….a block wobbles. Someone we care about betrays us…..blocks fall. The phone rings and life is never the same…..the tower topples to the ground. We whine. We worry. We cry. We. Get. Mad. Here’s what I’m learning: Our towers will always get knocked down. In other words, we need to stop trying to do the constructing ourselves and hand the job over to the true Creator, allowing Him to do the designing. When we build on the foundation that is Christ, our towers may teeter in the winds of life; circumstances may rearrange our blocks, but the LORD’s purpose will prevail. Our towers will not fall. I’m going to be honest; it’s not easy for me! Just like I wanted to protect and keep the carefully made tower I built with my grandsons, I desire to control my everyday. Silly, right? Maybe you’ve been watching your own towers get knocked over, too. It’s time we put away the self-made architects’ plans, give up the contractor’s hats, and instead become laborers building a life under God’s direction. A life that when given up, is actually saved. It doesn’t get better built than that! This entry was posted in #Write28Days, Blog, Five Minute Friday, Inspiration, Life Moments and tagged #fmf, #write28days #hopewriterlife, blocks, build, control, Five Minute Friday, Lord's purpose, towers on February 9, 2019 by Cindy.